At the turn of the 19th century, the upheaval of the “Reign of Terror” and Napoleonic Wars resulted in a worldwide rise in gold prices. With the U.S. Mint statutorily bound to the weight specifications and 15 to 1 silver/gold ratio defined by the Act of 1792, the fluctuating market price of precious metals wreaked havoc with U.S. coinage, particularly the largest gold coin, the flagship $10 Capped Bust “Eagle.” By 1795, an ounce of gold worth 15 ounces of silver in the United States was worth 15.5 ounces of silver in Paris. That was enough motivation for bullion brokers to buy United States gold coins, mostly with Latin American silver coins, and ship them to Paris to be sold. By 1813 the ratio would reach 16.25:1, and before long, 98% of all U.S. gold coinage would be destroyed. At the end of 1804, President Thomas Jefferson ordered eagle production stopped. It would be thirty-four years before production resumed. It wasn’t supposed to be that way. Years before, Alexander Hamilton had envisioned a monetary standard where coins of other metals would be simply a convenience, and only gold would be legal tender. He believed gold to be the most price-stable of the precious metals and less sensitive to changes in supply. Congress thought his idea to be utopian and idealistic. In the 1790s, gold was scarce, but silver coins, especially from Latin America, were plentiful. Fortunately, Congress settled on a bimetallic standard. At least silver coins, even if they were foreign silver coins, gave the new Republic a ready supply of money for commerce.It ultimately took two separate Congressional Acts, that by 1838, adjusted the content and fineness of U.S. gold coins enough to allow them to remain in circulation. Mint Director Robert M. Patterson was instructed to produce eagles, and Acting Engraver Christian Gobrecht, replacing the ailing William Kneass, prepared dies for a new design. The first coins, those of 1838 and early 1839, are distinctly different than subsequent issues: Each has Liberty’s shoulder line sharply pointed and positioned between the twelfth and thirteenth star. In the fall of 1839, Gobrecht reworked the bust and centered it over the date. This designwith the exception of the added motto in 1866 remained basically unchanged until the end of the Coronet series in 1907, when it was replaced by Augustus Saint Gaudens’ Indian Head motif. Struck in Philadelphia (no mintmark) every year of the series, No Motto eagles were also minted in New Orleans (O) from 1841 through 1860, and in San Francisco (S) from 1854 through 1866. About 5.3 million business strikes and 400 proofs were made, but unfortunately, few were preserved. Mintages were small and most survivors didn’t make it past the recall and meltings of the 1930s. As a result, it is difficult to find high grade specimens of any date in the series. There are no “common-dates” in uncirculated conditionevery issue is rare, and only a handful even approach the grade of MS-65. Superb pieces occasionally appear, but almost exclusively in sales of the largest and most famous collections. Although few individuals attempt to assemble complete date and mintmark sets, some pursue the issues from a single mint, or one from each mint. A collection of New Orleans eagles paralleling the two decades leading up to the Civil War and the Confederacy’s seizure of the branch there consists of twenty coins. A San Francisco set, tracing the first eagles struck at the new min tfrom the Gold Rush days to the end of the Civil War entails just thirteen pieces. Most collectors however, are content to find just one high-grade specimen for their type sets. Numismatists anxiously await a complete inventory of the fortune in gold coins found aboard the wreck of the S.S. Central America in 1987. Still under salvage in 1994, the ship was lost off the South Carolina coast in an 1857 hurricane while carrying over 1.2 million dollars in gold. Many coins recovered to date are in pristine condition, most notably 1857-S double eagles. Perhaps early S-Mint eagles will also be found. 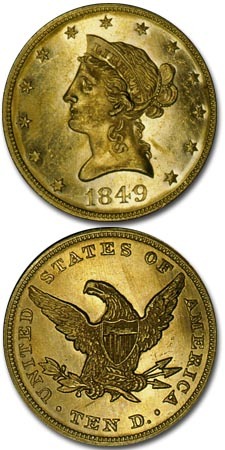 The Liberty Head eagle continued to be minted until 1907 with only one major change to the design. The carnage of the Civil War and the terrible upheaval that followed found the population of the country in a religious and philosophical mood. A desire to nationally express this feeling led to the addition of the motto IN GOD WE TRUST to U.S. coins. First used on the two-cent piece of 1864, the motto was added to the Coronet eagle in 1866, inscribed on a ribbon over the eagle’s head. Where are my foreign coins from?